The UMASS Jazz Ensemble will present a one hour, free performance at the South Hadley High School Auditorium. The performance is part of a day-long workshop and rehearsals with students from UMASS , PVPA, South Hadley Middle School, and South Hadley High School. South Hadley’s second annual Jazz Fest features showcase performances by the Berkshire Hills Music Academy Jazz Band, South Hadley Middle School Jazz Band, South Hadley High School Jazz Band, and the Pioneer Valley Performing Arts High School Rock & Soul Revue. The showcase will conclude with Frank Newton’s special arrangement of the Screaming Eagle of Soul’ Charles Bradley’s “Ain’t it a Sin” performed by both the Middle School Jazz Band and the PVPA Rock & Soul Revue. The afternoon continues with concert performances by the dazzling Valley Jazz Divas, backed by the Green Street Trio, and the venerable Jeff Holmes Big Band will close out the the program. The event is free, open to the public, and light refreshments will be prepared by students from the High School Culinary Program. This jazz ensemble is a group of advanced musicians from grades 5-8, which concentrates on the study, preparation, and performance of the various styles of jazz from the past and present. Throughout the school year, MESMS Jazz Band performs at concerts, provides entertainment for community groups, and competes in regional contests for critique and awards. 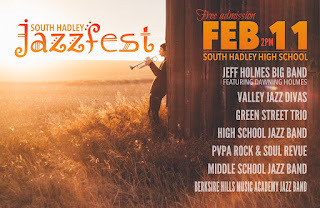 This is their first time being involved with South Hadley Jazz Fest. As the MESMS Band Director, Brooks Holmes leads over 100 students in grades 5-8 in pursuing their dreams in instrumental music. His Concert & Jazz Bands are well known throughout the local & state community for their versatility, discipline & technique. Brooks is a strong advocate for implementing music technology into his teaching and often hosts Music Education Majors from Westfield State & UMASS Amherst. PVPA ROCK & SOUL REVUE is the premiere 7th and 8th grade performing ensemble for electric and popular music. The group is comprised of students who are learning rhythm section instruments such as drums, electric bass, keyboard/piano, and guitar and features multiple singers who create vocal arrangements for the repertoire. The group is under the direction of PVPA music faculty member Rahul Roy. Formed as a duo, Performance Troupe members Marco DiSantis (guitar) and John Libera (saxophone/clarinet) began working together in 2015. Under the direction of Dirk Litzner and Andy Anderson, they quickly built a repertoire of jazz standards and classics from the American Songbook. Fellow Troupe members Franklin Nichols (piano) and Tim Connor (drums) were added in 2016, forming the Berkshire Hills Jazz Quartet. Since 2016, the Jazz Quartet has performed all across New England, from fundraisers, conferences and corporate events, to parties and local jazz festivals. Dirk Litzner is a music educator, performer, producer, and composer originally from Germany. He has taught for over 20 years in a variety of settings in Germany and the US. Litzner's work as a composer and music editor includes credits on various American Network Television Channels including FX, The Discovery Channel, and the History Channel among others. Jeff Holmes leads this eponymously named 17-piece ensemble featuring vocalist Dawning Holmes who performs tunes made popular by the likes of Ella Fitzgerald, Etta James, Dinah Washington, Lena Horne, Billie Holiday, and Koko Taylor, and others. During its 30 year history, the band has toured Russia, made appearances at the NYC Brass Conference and the International Trumpet Guild Conference, and backed the likes of Mel Torme, Max Roach, Wayne Bergeron, Conrad Herwig, David “Fathead” Newman, and Jim Porcella. Dawning Holmes has sung in jazz clubs from New York City to London and Germany, and has guested with Paul Winter, the UMASS Studio Orchestra/Jazz Ensemble I, the Jeff Holmes Quartet at the Springfield Jazz and Roots Festival, and more recently opened for comedian Bob Newhart. She is currently working on a CD project of her original music and leading her own quartet. Jill Connolly, Barbara Weene and Carol Abbe Smith have been singing together for about 10 years. Individually, they have been performing most of are adult lives. They love swinging and be bopping and creating lush harmonies. They have been fortunate to work with some of the best Jazz musicians in Western Mass. Recently honored with The Pioneer Valley Creative Buzz, Paul Arslanian, George Kaye, and Jon Fisher have been bringing jazz every Tuesday night to the Clarion Loft in Northampton over the past four years. The trio also cultivates local jazz culture by inviting young local musicians to play alongside seasoned professionals Jazz musicians at these weekly sessions.